Find quick facts about bed bug bite symptoms, details about the variety of symptoms people experience, and videos about the signs of bedbug bites all right here. At the end of each section, you'll find a link back up to this menu so you can check out just the sections that interest you in whatever order you choose. The photos below show immediate symptoms of bed bug bites (left) and the reaction a day later (right). Note: Dr. Sorkin regularly feeds his laboratory bed bugs, so his skin is likely more sensitive than the average person as a result of frequent and prolonged exposure to bed bug bites...not to mention that this was the result of A LOT of bedbugs feeding in one small area from a laboratory vial. See more pictures of bed bug bites on the bite page of our bed bug photo gallery. Bed bug bite symptoms vary from person to person and some people have don't react at all. This was true in our case. While my husband was crawling out of his skin, I didn't really have any symptoms at all...at least in the beginning. This is part of why I didn't believe him at first (read more about that here). They are pretty much like any other allergic reaction and can be confused with other things like other insect bites, poison ivy, and even allergic reactions to chemicals in things like detergents or perfume. 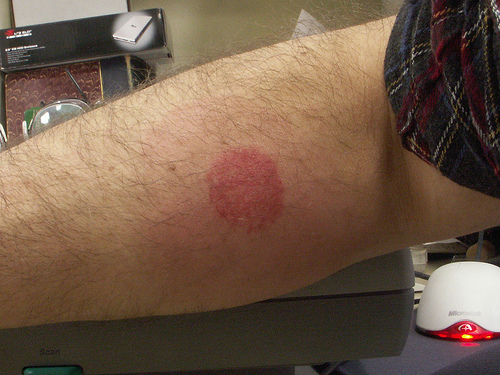 Symptoms include itching, redness, and swelling of the bite area. 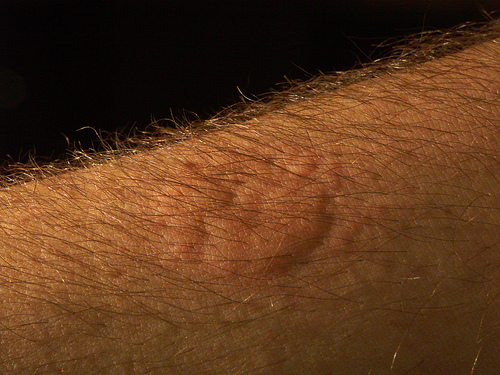 Itchy skin reactions are the most common symptom. And that can vary from a mild skin irritation...to mind-crushing itchiness that makes you just want to crawl out of your skin! The bites may show up in a grouping of three (sometimes referred to the "breakfast, lunch, and dinner" pattern), sometimes in a line or cluster of bites. But they can also be scattered in no recognizable pattern. Sensitivity to bed bug bites can increase the longer a person is exposed to them. This is what happened to me. I had no symptoms in the beginning, but near the end I was suffering from itchy red bites just like my husband. IMPORTANT NOTE: Bites are not proof that you have bedbugs. They could be the symptoms of something else or you could have been bitten by bed bugs, but not brought them home. The only way to know for sure is to find evidence of them. 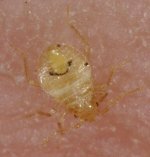 Learn about the 9 symptoms of bed bugs and then check out more pictures of the signs of bed bug infestation in the picture gallery. 30% displayed no symptoms of bed bug bites at all! What's even more interesting is that still fewer people over the age of 65 reported reactions. These so-called secondary symptoms are often overlooked. In reality they can be the most devastating part of dealing with bedbugs. Personally, I can identify. While I didn't suffer the physical symptoms of bed bug bites until later on (after I had been bitten for a while and developed a sensitivity), the emotional burden was heavy. You can read our story here. In this Health Checks video from the National Pest Management Association, Dr. Parada provides a brief overview of bed bug bites, how to treat them, and when to see your doctor. In my opinion its a good summary of much of the information shared on this page. This video is shared via our Bed Bug Bites Video Playlist on the Bed Bug Answers Channel on YouTube. You can pause the video at the end or let the whole list of related videos (displayed on other pages of the bedbug bites section of this site) play through. If you want to skip to another video, just click the playlist icon in the upper left corner to see the entire list. Not sure if its bed bugs bites or symptoms of something else? Narrow it down by answering the questions on this page. You can also see more pictures of bed bug bite symptoms here and learn about how to treat the symptoms of bedbug bites here... including some simple home remedies that might surprise you!